Jupiter is now low in the western sky at sunset, and is lost behind the sun at the end of the month. 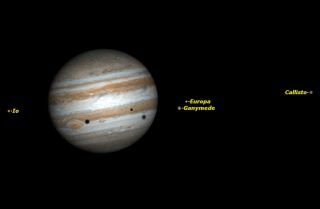 Jupiter will end its brilliant year-long showing on Sunday evening (June 29) with a rendezvous with a young and slender crescent moon. Indeed, the moon will be only 6 percent illuminated and just 2 1/2 days past new phase. The celestial pair will be setting about an hour after local sunset on Sunday. To enhance your chances of getting a view of both moon and planet, make sure that your prospective viewing site has a clear and unobstructed view toward the west-northwest part of the sky. Half an hour after sunset, the moon and Jupiter will hang only about 6 degrees above the horizon. Jupiter will be nothing more than a bright white dot against the twilight background. You can accentuate your chances of picking up both moon and planet by scanning that part of the sky with binoculars; once you sight them, getting a glimpse of the pair with your unaided eyes should be a bit easier. After Sunday, you can pretty much say goodbye to Jupiter as an evening object, as it will be rapidly swallowed up by the sunset glow. The gas giant will be in conjunction with the sun on July 24 and will not reappear again until sometime in mid-August, when it will transition to the early morning sky. However, Jupiter is destined to put on a nice showing in the dawn sky on Aug. 18, combining with brilliant Venus to produce 2014's closest conjunction of two planets (and the two brightest planets, no less), making for an attractive celestial scene. So for Jupiter, this is not "goodbye" but rather "see you later this summer." Editor's Note: If you have an amazing photo Jupiter or the moon that you'd like to share for a possible story or image gallery, please contact managing editor Tariq Malik at spacephotos@space.com. Joe Rao serves as an instructor and guest lecturer at New York's Hayden Planetarium. He writes about astronomy for Natural History magazine, the Farmer's Almanac and other publications, and he is also an on-camera meteorologist for News 12 Westchester, N.Y.Follow us @Spacedotcom, Facebook or Google+. Originally published on Space.com.